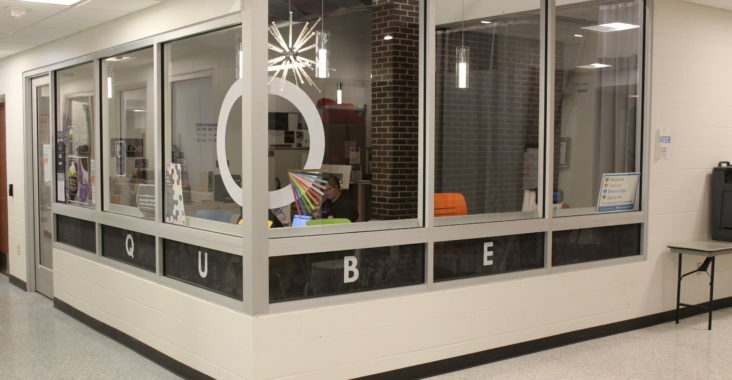 The Qube, located in the Merle M. Price Commons, is the University of Wisconsin-Stout’s headquarters for lesbian, gay, bisexual, transgender, questioning/queer, intersex, asexual/aromantic students and more (LGBTQIA+) students and allies. The Qube had been undergoing construction recently to revamp and expand the space. The new Qube’s official grand opening took place on April 5. Lex Redfern, a freshman majoring in human development and family studies, serves as an events coordinator and assistant to the Qube. Redfern explained that the old Qube was much smaller than the current new and improved Qube; the size increased by 73 percent. The old Qube had two parts, the entrance where the LGBTQIA+ program coordinator, Julie Miller had her desk located and a few couches. The second area in the old Qube was a library and study area. The new Qube has many more areas. There is a work and study space out front with tables to work on, a student lounge in the back with couches, a sink, a microwave, a coffee maker, gender neutral bathrooms and a staff desk and desktop. There are also two areas for relaxing. In addition, there is a new storage area that they have for a donations closet. Julie Miller has her own office, secluded from the rest but still attached. Frances Bates, a senior majoring in Industrial Design, has lived through the Qube in its old space for four years. She explained how she would go just to hang out, as well as attend events hosted there. “The old space was cramped and passers by were often confused what the space was. This remodel has been quite the improvement. Now, the Qube is located where everyone sees it and has plenty of room for every possible activity they want to host,” said Bates.